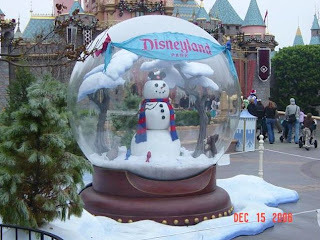 Disneyland....the happiest place on earth. I guarantee you that this won't be the only post about a restaurant inside the Disneyland Resort in Anaheim, CA, including the exclusive Club 33 (it'll be a long one - still working on it). We have annual passports, and we will never get tired of visiting at least four times a year. We love to visit during the holiday season to see all the decorations. I bring to you one of the BEST tasting meals that I've ever had at Disneyland. We stayed on property, so we woke up early to have breakfast at Cafe Orleans. Cafe Orleans is located in New Orleans Square somewhat across from the Royal Street Veranda, where they sell gumbo and chowder in bread bowls. Are you ready for this? 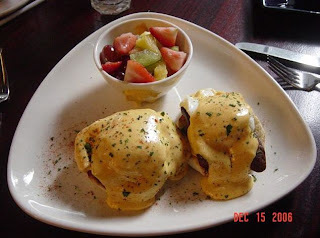 My husband got the andouille sausage benedict, and I ordered the Mickey Mouse beignets. Heaven. Delicious-ness. I mean, creamy hollandaise over crispy, but mealy andouille sausage, perfectly poached eggs and traditional english muffin? I was SO jealous that I didn't get this, but believe me... the next time we had breakfast here, we BOTH got this, and even shared the beignets. Oh wow, I didn't even get to the beignets yet. 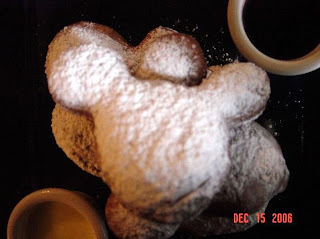 Cute, Mickey shaped beignets dusted with tons of sweet powdered sugar, served with two sauces, raspberry and vanilla. They were delicious. Slightly crisp on the outside, and nice & warm in the inside. I had a cup of coffee with them, so it was like having "coffee & donuts". There was a gentleman across the way who saw that we ordered these. He asked for only one because the server brought him one on a small saucer. 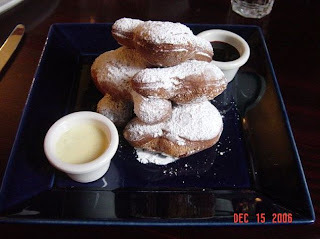 Shortly after I took pictures of our dishes, he took out his camera (much fancier than ours) and took a picture of his single Mickey beignet. I was stoked that he took pictures of his food too. His pic probably didn't come out blurry like mine - haha. Although they were simple flavors, I loved every bite and is one of the best tasting meals in the Resort. Sadly enough, Cafe Orleans doesn't serve breakfast anymore. We visited in March of this year and tried to make reservations for breakfast, but that was the news they gave us. Boo!